Recently we talked about the fact that little things matter. Click Here if you missed it. Taken one at a time they might not make hardly any difference but taken together they can mean the difference between a profitable campaign and one that gets stopped because there is no hope of making it work. 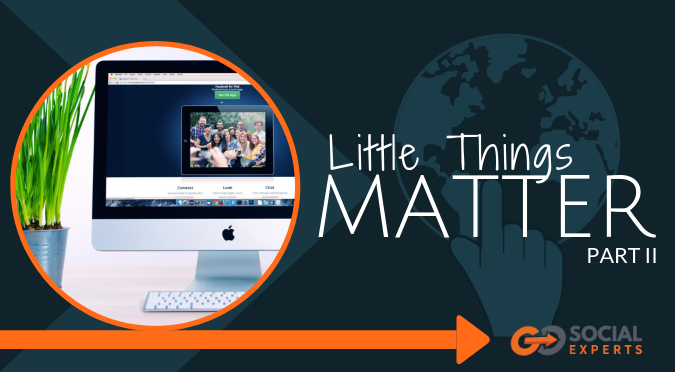 If you’d like to download the complete list of Small things that matter you can Click Here to get download it now. In the article, we’re going to talk about the first three items. Does your landing page have the same feel as the other pages on your site, same or similar colors, font, and style of pictures? What URL did you choose? What favicon is on your landing page and is it the same as the one on your website? Landing Page Style, Colors, Fonts, and Pictures? This is the most obvious one of all the components we’re going to talk about, and it still gets missed. First, what is a landing page? It is a webpage that you send someone to that has one purpose. That may be to collect an email or it may be to sell something. What makes it different from a traditional webpage is that there is only one thing to do or leave. There are no distractions to distract a viewer. To create high performing landing pages there are programs you can subscribe too. Programs like Leadpages, our favorite, or Click Funnels or Thrive Themes, etc. There are many to chose from. When you’re creating your own on one of these services you’ve got to be aware that you want to use the same or similar colors to what’s on your website, as well as a similar font and pictures to what’s on the rest of your site. If you have a formal website, your landing pages need to have a formal feel. If your site is fun and energetic, your landing pages need to be as well. The fonts you use on the landing pages should be the same as what’s on your website, or at least similar. All of this will help your conversions. After all the landing pages job is to do one thing, but once people have done that and they go to your website, will they feel at home? If not you’ve made a sale which is great, but you don’t get to keep the customer, and the real money is made after the first sale. When you do this well, your new customer will feel at home on your site or one of your landing pages. First for those of you who aren’t sure what a URL is, it is the address of a web page and it shows up in the address bar of your browser. Now, this is one of those things that you wonder why anyone would notice the URL. Well if you notice some URLs spell out what is on the page, others are gibberish on purpose, if you want to hide a URL so the only way it can be found is from a link, and others give customers the wrong message. After all, as a consumer do you want to fill in information on a page labels xxxxxx/salespage, or leave your contact information on a page labeled xxxxxxxx/optin. URL names like these tell people that you’re going to be selling to them and that you’re not really trying to help them, you just want something from them. These URLs let the viewer know what they are and they make sense. And for the website owner, it lets them know what is on the pages. Both are wins. There are other benefits of using a good URL, and one of the biggest is to let Google know what your site is about. I’ve recently gotten calls and clients from people around the world searching for Facebook Funnel Creation, and since I have pages with that in the URLs I have gotten calls and clients from these people. What Favicon is on your landing page? So what is a favicon you ask? It is the little picture on the tab at the top of a webpage that is in the browser tab. What many marketers miss is that when you’re using a Leadpages or Clickfunnels page the default favicon is the one for the company. When a viewer sees a favicon on a webpage that they think is from a different company they get confused, and confused minds don’t opt-in to mailing lists and they don’t put their credit card into the order forms. After all, what company are they talking to? It only takes a few minutes to fix this as after the first time you create a landing page you have the favicon on hand. If you go to the help area of the software you’re using it will show you how to change the favicon, and it only takes a few seconds to do it. All of these tips take only a few seconds to a few minutes to do if you plan for them ahead of time and implementing them will improve your conversion rates. In our next article we’re going to be talking about tone, make sure you check it out, and if you want the downloadable sheet so you can evaluate your marketing pages Click Here to download it now. P.S. For an in-depth look at a complete Facebook marketing system looks like, sign up for my FREE Masterclass on Facebook marketing: Go Social Experts Facebook Marketing Masterclass. This Free course is a 5-day video series with a video each day, which goes into depth about each of the steps needed to create a profitable Facebook marketing machine.